HAVE YOU EVER WONDERED WHY SINGING MAKES YOU FEEL SO GOOD? To answer the question, we need to understand what sound is. Sound is vibration; everything in creation is in a state of vibration, from the smallest atom to the largest star system. When an object vibrates, it creates a sound - this sound is called its resonant frequency. When an opera singer matches the resonant frequency of a glass, it shatters. Luckily our bodies are less brittle and enjoy the vibration of external sounds as long as they are harmonious. When we feel unwell or unhappy, we say we feel "out of tune" or "out of harmony". Our body is like an instrument that can be tuned up. We can tune ourselves up or allow others to sing to us. What actually happens to our bodies when we sing? The note we sing will vibrate all the cells in our body. Research has shown that singing the musical scale regularly can actually destroy harmful cells in our body. Healthy cells seem to thrive with harmonious sound. (1). Another effect of singing is produced by the combination of notes we choose to sing. If we sing two different notes, one after the other, we create a musical interval. Each musical interval will have a different effect on our body, our emotions, and our mind. This explains why we choose different types of music at different times. Generally, simple intervals like the third and the fifth are uplifting and sound pleasing to the ear. Minor intervals can induce tension or feelings of sadness. Some intervals are discordant and can help us to get in touch with darker emotions. In an experiment, two people sang the octave into an oscilloscope (an instrument which measures sound waves). On the screen of the oscilloscope appeared the symbol of infinity, the figure eight. Is it a coincidence that the Latin word for eight is "octave"? (3). Architects used these ratios when building the great cathedrals and ancient sacred buildings. Goethe described architecture as "frozen music". The ancient people used this knowledge when they constructed sacred sites like Stonehenge, Newgrange or the King's Chamber in the Great Pyramid. When we hear music rich in harmonics, like Gregorian Chant, Indian classical music or "acappella" singing it induces an altered state of consciousness. It changes our brain patterns so that we feel more relaxed, more connected with the music. Ancient cultures understood the power of harmonics. Stringed instruments are particularly rich in harmonics. David played the harp to heal King Saul's depression, Orpheus played the lyre, another stringed instrument in Ancient Greek mythology. In India, Saraswati, the Goddess of wisdom and music, is seen playing the Veena, a stringed instrument. When we sing simple vowel sounds in a resonant place like a church, it is possible to hear the harmonics or overtones produced above the note we are actually singing. When groups of people tone together, it produces a tremendous feeling of connectedness. Anyone who wants to experience the power of vocal harmonics should listen to "David Hykes/The Harmonic Choir - Hearing Solar Winds" - Ocara. Singing very simple chants has another effect. After a period of chanting the mind becomes relaxed and clearer. This effect is used in most spiritual traditions. In India this practice is called 'mantra' or 'kirtan'. Simon Heather explores these four aspects of sound - Resonance, Intervals, Harmonics and Chant in his book "The Healing Power of Sound." In the words of the famous Beach Boys song there were "good vibrations" resonating throughout this summers Festival of Yoga in Durham. The weekend of events organised by the British Wheel of Yogas Northern Region was a re-SOUNDING success. More than 200 people attended the festival at Durham Universitys College of St Hild and St Bede. This years theme "Yoga and Wellness" was explored throughout the weekend with yoga teachers leading many special yoga classes to help restore health. The key focus of the weekend was on principal guest tutor, the sound healer Simon Heather, founder of the College of Sound Healing. Simon, an internationally known healer and author, led seven seminar sessions during the weekend. These covered a wide range of sound based techniques to help get the body and the vocal chords buzzing. The workshops also invited people to tune in to their Higher Self and seek out true health and happiness by tapping into the bodys own vibrations. Simon is one of the leading teachers in the field of sound healing. Over the last fifteen years he has written five books and produced six CD's. Simon Heathers sessions were a true tonic for the mind, body and spirit. He took everyone on wondrous journeys around the world using the power of sound through chanting, using mantras and song to link us all up to a magical feeling of well being. Simon used a variety of fabulous techniques to help uplift the spirit by tapping into the very essence of our being through the vibrations of sound within and around our bodies. His workshops were a joyous mixture of fantastically funny techniques and ecstatically exhilarating chants and song. His gentle and often very witty approach to helping people find their true voice was an inspiration to those taking part. Simon helped lift our often too serious approach to life by getting participants to free their voice by laughing out loud. These sessions proved to be great ice breakers helping many to get rid of inhibitions and simply let go. Mixing the vocals with dance was another way of really getting the spirit moving. The infectious laughter sessions were even broadcast to the North East. Radio Newcastle conducted a live interview with Simon at 8 am on the Saturday morning. Simon was joined by a group of early morning yogis who had just completed a yoga class. The group broadcast a laughter session to everyone in the North East for the radio stations breakfast show. The interviewers were at first very sceptical but were soon won over by Simons laughter session. He also led the group of yogis in a session chanting OM over the airwaves and helped uplift the hearts of radio shows hosts and listeners. Also on Saturday he led a session called Sounding Chakras which was a very deep experience for many of the hundred or so taking part in the beautiful setting of the colleges Joachim Chapel. He guided participants through the "bija" or "seed" mantras for the bodys energy wheels the chakras. By creating the bija manrta sounds for each chakra he helped guide the way for us to help balance the chakras through the power of sound. The journey through the chakras was a way of leading people to different aspects of awareness and consciousness, something we do daily in our yoga practices. Simon, who has himself a strong yoga background, now devotes his time and key approach to healing by training and helping therapists and other healers who want to use sound in their healing practices. He is doing a special sound healing training course in the North starting this October. At the festival he took groups from 20 people up to more than 100 through the sounds which awaken the body. By getting people to link hands chanting and singing he created a circle of love which tapped into a deep rooted feeling of oneness. This was for me a very moving and caring experience. In his session on the "Healing Power of Sound" Simon highlighted the way the body can help repair itself by using simple exercises to release blockages from the voice so that it can be used for healing. He pointed out how the body, every organ and cell, vibrates at certain frequencies and how we can bring it all into "tune" like a musical instrument to find its own true balance. This session showed that our chanting of OM and other sound work in yoga can truly reach the parts of the body that are out of sorts and bring it into harmony. The combination of posture work, breathing, mantras and meditation are very special. There were a varying number of yoga classes held over the weekend led by 24 teachers who devoted their time freely to help make the event a true success. They delivered something for everyone giving samples of a wide spectrum of yoga paths. Everything from gentle flowing styles to more powerful healing work and the deep rooted relaxation of yoga nidra was covered. The yoga styles embraced included Kripalu, Bihar, Iyengar, Ashtanga, Dru and Kundalini.. There was something for the beginner right through to the advanced yogi. A huge thank you to all who attended and helped tune in to that "unity" to make the event special. water, cancer cells, neurones and a range of conditions. Sound has been used as a healing force for thousands of years. All ancient civilizations used sound for healing. Traditional cultures still surviving today understand the remarkable healing power that lies in sound. In the Bible we are told that David played his harp to lift King Sauls depression. Egyptian papyri over 2,600 years old refer to incantations as cures for infertility and rheumatic pain. The ancient Greeks believed music had the power to heal body and soul. They used the flute and the lyre for treating illnesses such as gout and sciatica. It is reported that Alexander the Greats sanity was restored by music played on the lyre. There is an ancient Greek saying, Men have song as a physician for pain. Sound healing is the therapeutic application of sound frequencies to the body/mind of a person with the intention of bringing them into a state of harmony and health. The dictionary defines harmony as congruity of parts to their whole or to one another. Health is defined as the state of being bodily and mentally vigorous and free of disease. The French ear, nose and throat specialist Dr Alfred Tomatis has devoted the last 50 years to understanding the ear and its function. He believes that the ear is the most important of all our sense organs. The ear controls the bodys sense of balance, rhythm and movement and is the conductor of the entire nervous system. Through the medulla, the auditory nerve connects with all the muscles of the body. Hence, muscle tone, equilibrium, flexibility and vision are affected by sound. Through the vagus nerve, the inner ear connects with the larynx, heart, lungs, stomach, liver, bladder, kidneys, small intestine and large intestine. When an opera singer vibrates a glass with their voice, they have matched the resonant frequency of the glass. As the singer increases the volume of their sound, the resonance becomes too great for the forces that hold the glass together and it shatters. Modern medicine now uses sound waves to break up kidney stones and gallstones. Every organ, every bone, every cell in the body has its own resonant frequency. Together they make up a composite frequency like the instruments of an orchestra. When one organ in the body is out of tune it will affect the whole body. Through sound healing it may be possible to bring the diseased organ into harmony with the rest of the body, hence avoiding the need for drugs or surgery. The principle of entrainment states that powerful rhythmic vibrations from one source will cause the less powerful vibrations of another source to lock into the vibration of the first source. Nature always seeks the most efficient state; it takes less energy to pulse in co-operation that in opposition. In the 18th century Ernest Chladni, a German physicist, found that when a violin bow was drawn vertically across the rim of a metal plate the sound waves produced created patterns in sand sprinkled on the plate. Different musical tones would cause the sand particles to move into geometric patterns. In the 1960s Hans Jenny, a Swiss scientist, spent over ten years conducting experiments to discover the effects of sound waves on materials placed on metal plates vibrated with sound. Materials such as glycerine, mercury, gel, powder and iron fillings were used. He photographed the patterns created. He found that low frequency sounds produced simple geometric shapes in the materials. As the sound frequency was increased, these simple forms would break up and more complex patterns would appear. The sound OH would produce a perfect circle. In 1974, Fabien Maman was working as a professional jazz musician. He noticed that certain musical keys had an energizing effect on both the musicians and the audience. Fabien worked with the French physicist Joel Sternheimer. Sternheimer had discovered that elementary particles vibrate at frequencies in accordance with musical laws. They found that body tissue, organs and acupuncture meridians each have a musical note. A few years later, Fabien met Hlne Grimal, a senior researcher at the National Centre for Scientific Research in Paris. They devoted a year-and-a-half to study the effects of sound on normal and malignant cells. Using drums, gongs, flutes, guitar, bass and a xylophone, they investigated the effects of sound on healthy blood cells, haemoglobin, and the Hela cancer cell from the uterus. They found that even at 30-40 decibels the sound always produced noticeable changes in the cells. As the sounds progressed up the musical scale there would be an explosion of the cancer cells at a certain frequency as the sound travelled outward from the centre of the cell to its outer membrane. The experiment yielded the most dramatic results when the human voice was used. Fabien Maman took healthy blood cells and played a xylophone to them. He photographed the changes in the electromagnetic fields around the cells using Kirlian photography. Subjected to a chromatic scale of frequencies, the slight difference of a half tone would produce a completely different shape and colour in the energy field of the cell. He found that the note C made them longer, D produced a variety of colours, E made them spherical and A (440Hz) changed the colour of their energy field from red to pink. In his next experiment, Fabien took a sample of blood from a persons finger. He then asked the person to sing the seven notes of the major scale to their own blood cell. With each note, the cells energy field changed its shape and colour. When the person sang an F to their own blood cells, the cells resonated perfectly with the voice, producing a balanced, round shape and vibrant colours of magenta and turquoise. A Japanese scientist, Masaru Emoto, wanted to find a way of scientifically evaluating water quality. He decided to freeze samples of water taken from different sources to compare their crystalline structure. When pure water crystallizes it forms a pure crystal; would contaminated water also form a pure crystal? Water was placed in petri dishes in a freezer for two hours, then placed under a microscope and photographed at a magnification of 200-500 times. Although the crystals that formed were all unique, the crystals from water of the same source were all similar in shape. Over a four-year period his team took 10,000 photographs. Masaru Emotos next experiment was playing music to water. He placed distilled water in between two speakers and played one piece of music fully at normal volume. Then he froze the water. Since our body is made up of 70% water, Masaru Emotos work demonstrates that we are constantly being influenced by the sounds around us and by the information stored in the water we consume. Slower tempo music slows our breathing rate. The human heartbeat will tend to match the rhythm of music. Listening to Pacabels Cannon, for instance, at around 64 beats per minute, the rate of a resting heart beat, will slow our breathing rate and heart rate and change our brain wave pattern from beta to alpha. Music will also calm our nervous system and affect metabolism. This explains why some people can sing in tune while others consider themselves tone deaf. It is impossible for us to make a sound unless we have heard that sound or note before. I have found from experience in teaching voice work that once a persons hearing is reawakened then they can begin to hear what is sung to them and can then accurately copy this sound. Toning is defined as to make sound with an elongated vowel for an extended period. Toning with other people creates a feeling of unity. It also helps us to release stress and repressed emotions. Regular toning and humming helps to re-energize the body and restore health to the mind, body and spirit. Alfred Wolfson was a German-born singing teacher who was plagued by the sounds of artillery and human agony that he experienced as a soldier in the trenches in World War I. Wolfson cured himself of aural hallucinations by singing the terrible sounds that haunted him. He went on to develop a therapeutic method that was based on using the voice. He taught his students to make spontaneous noises, including those of animals, birds and even machines. The principle of entrainment explains how sound healing works. A harmonious sound projected at a person who is in a state of disharmony will eventually bring them into resonance with the harmonious sound. Our atoms, molecules, cells, glands and organs all have a vibrational frequency. Sounds from outside our body will stimulate sympathetic vibration in the molecules and cells of our body. The sound wave created by a person singing or playing an instrument will carry information to the receiver of the sound. We all know that a song can be sung with a loving intention or an aggressive intention. When a mother sings a lullaby to her child, the child feels the love in the mothers voice and is rocked to sleep. At a football match, fans sing aggressive chants directed at the opposing supporters and their team. Here the intention is to intimidate. When two objects have similar vibratory characteristics that allow them to vibrate at the same frequency, they form a resonant system. When a C tuning fork is struck, another C tuning fork close by will also begin to vibrate. For healing to occur there must be a resonance or rapport between healer and patient. 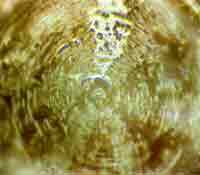 When working with a person in a sound healing session I use my voice to scan over their body. I find that my voice will break up over areas of their body where there is pain, disease or poor function. I then administer sound healing through my voice using different tones, vowel sounds and harmonics until the imbalance is cleared. I use healing songs, prayers and mantras. I will also help a person find their fundamental sound. I use a wide range of sound healing techniques to treat all conditions. These include combining my voice with instruments, using sound in combination with bodywork, encouraging the person to express their pain through sound, using tuning forks and different musical intervals. Dissonant intervals can be used in sound healing to help a person to get in touch with painful emotions. When the dissonance is resolved by sounding the interval above, the person listening will experience a feeling of release, lightness and joy. If the person has experienced deep trauma, I will often chant the persons name to call back their spirit. Sound healing can be combined with other healing therapies such as massage and bodywork. After a sound healing treatment most people report a feeling of deep relaxation and an improvement in the function of mind and body. Structural imbalances in the body will often correct themselves during the sound treatment. Goldman Jonathan. Healing Sounds. Element Books. Shaftesbury. p30. ISBN 1-85230-314-X. 1992. Tomatis Alfred. The Conscious Ear. Station Hill Press. New York. ISBN 0-88268-108-7. 1991. Jenny Hans. 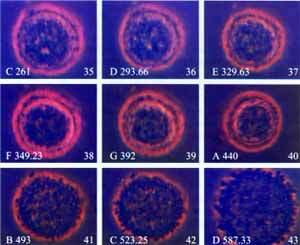 Cymatics, Volumes I and II. Basilius Presse AG. Basel. 1974. Maman Fabien. The Role of Music in the Twenty-First Century. Tama-Do Press. California. p61. ISBN 0-9657714-0-7. 1997. Maman Fabien. ibid. p56. Photograph reproduced with permission from Fabien Maman. Campbell Don. The Mozart Effect. Avon Books. New York. pp242-243. ISBN 0-380-97418-5. 1997. Maman Fabien. ibid. p80. Photograph reproduced with permission from Fabien Maman. Oliver Jim. Notes from CD Harmonic Resonance. The Relaxation Company. New York. 1995. Emoto Masaru. The Message from Water. HADO Kyoikusha. Tokyo. ISBN 4-939098-00-1. 1999. Emoto Masaru. ibid. pp77,87. 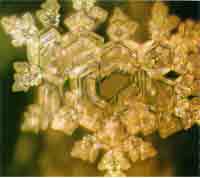 Photographs reproduced with permission from Masaru Emoto. Harvey Arthur. Music in Attitudinal Medicine. in Campbell Don ed. Music: Physician for Times to Come. Quest Books. Illinois. p189. ISBN 0-8356-0668-6. 1991. Lewis Mike. Why Music Heals Your Mind. Interview. Sunday Express. p51.21 May 2000. Joudry Patricia. Sound Therapy for the Walkman. Steele and Steele. Dolmen. Canada. p7. ISBN 0-9691687-0-5. 1984. Keys Laurel Elizabeth. Toning the Creative Power of the Voice. DeVorss and Co. California. pp10-12. ISBN 0-87516-176-6. 1973. Wilson Tim. Chant the Healing Powers of Voice and Ear. in Campbell Don ed. Music: Physician for Times to Come. Quest Books. Illinois. pp12-14. ISBN 0-8356-0668-6. 1991. In a recent nation-wide survey of health clubs in the USA researchers found that noise levels exceeded 110dB in 60% of clubs. Thirty minutes exposure to this volume can cause lifelong hearing damage. During a workout the body directs blood away from the head to the heart, legs and arms making hearing more susceptible to damage. The US magazine Health reported the story of a 34 year old woman who had attended aerobics classes for 15 years who had such severe hearing loss that she needed to wear hearing aids in both ears. According to the National Institute of Occupational Safety and Health prolonged exposure to sound above 85dBs can cause hearing damage. The decibel scale is a logarithmic scale which means that 95dB is ten times louder than 85dB and 105dB is a hundred times louder than 85dB. Between 1986-96 noise levels in the USA have increased by 11%. The resultant hearing loss is so great that an eighty year old Sudanese villager hears better than a thirty year old American. Noised induced hearing loss now begins at an early age. Loud sounds cause a constriction in the blood vessels in the ear and destroy the delicate hair cells in the ear that transfer sound vibrations into nerve stimuli. Damage to these hair cells can cause tinnitus, hyper or hypo sensitivity to sound as well as hearing loss. One of the main causes of hearing loss is the prolonged listening to loud music on personal stereos. Most personal stereos are capable of producing sounds up to 120 dB. The French Parliament has recently legislated to reduce the maximum volume on personal stereos to 90dBs. According to an article published in the Journal of the American Medical Association between the 7th and 12th grade the average teenager listens to 10,500 hours of rock music. A scientific study in 1994 found that adolescents who preferred heavy metal and rap music had a higher incidence of low school grades, school behaviour problems, drug and alcohol abuse problem and arrests compared with adolescents with other musical tastes. The New England Journal of Medicine reported that heart disease and hypoglycaemia were worse for workers working in noisy industries compared with those working in non-noisy industries. A study by Dr Shirley Thompson at the University of South Carolina found that exposure to excessive noise may raise our blood pressure by as much as ten percent. She found that exposure to loud noise increases the body's secretion of adrenaline causing the heart to beat more rapidly. Researchers at the University of Los Angeles found that the death rates for people living under the flight path of Los Angeles airport were substantially higher than for those people living in a comparable community living eight miles away from the airport. Loud noise, particularly sonic boom can also affect the unborn foetus causing congenital malformation. The UCLA researchers also found that noise pollution impaired the development and communication skills of children. A researcher in New York corroborated this finding. She found the school children whose classroom was on the train track side of a school were lagging one year behind a class of the children of the same age whose classroom was on the other side of the building away from the noise of the trains. A recent report on ABC News stated that scientists have noticed that underwater noise pollution from supertankers, oil exploration and military sonar is disrupting the breeding and migration patterns of sea creatures. Certain species of birds living by noisy roads or airports are failing to learn their mating calls from their parents and are unable to attract a mate. Dr Tomatis the French ear, nose and throat specialist has spent over fifty years researching the effects of sound on the human body. Tomatis found that learning difficulties in children are directly related to hearing difficulties. Missing frequencies within our hearing range will not only affect our ability to sing in tune but our ability to learn new things and stay healthy. Tomatis proved that our body and brain are literally charged up with energy if we listen to sounds rich in high frequencies. These high frequencies are found in nature in the sounds of the ocean, water flowing and bird song. Violin music by Mozart and Vivaldi is particularly healing, as is Gregorian Chant. Tomatis says that Gregorian Chant contains all the sound that the human body needs to be healthy. He discovered this remarkable phenomenon when he was asked to visit a Benedictine Monastery in Southern France where most of the monks had become ill and no doctor could cure them. Tomatis discovered that they had become ill after a new Abbott had abolished the monk's daily Gregorian Chant. As a researcher and teacher in the field of sound healing I am aware of how important it is for each of us to use our own voice to keep ourselves healthy. People who sing regularly generally enjoy better health than the rest of the population. Of all the professions, orchestral conductors enjoy the longest life span and often continue to work in their eighties. For thousands of years people have sung as part of their daily life. We are the first generation of people who have machines to sing for us. We can combat the invasion of external noise by singing, humming or toning. By using our voice we can tune ourselves up. With a little bit of help most people can sing in tune. Those who think they can't sing generally have frequencies missing from their hearing. Once these missing frequencies are restored people are amazed that they can sing in tune. Don Campbell is one of the worlds foremost authorities on the connection between music and healing. He has written many books on this subject. He has also produced a series of CDs called Music for the Mozart Effect. The Mozart Effect is a fascinating and inspiring book about the effects of sound and music. Don Campbell says that music is good for us, physically, emotionally and spiritually. Did you know that Gerard Depardieu; the great French actor could hardly string a sentence together before he embarked on a course of sound therapy? Did you know that Ronald Parkinson PhD a music professor at Northern Illinois University keeps his Parkinsons disease at bay by playing the harp? The disease struck him in his mid-twenties. Did you know that students who sing or play a musical instrument at school score higher in all other subjects than other non-musical students? The music of Mozart assists both sides of the brain to work together overcoming the left brain dominance of our Western society. Scientists suggest that listening to Mozart can help to improve concentration and enhance our ability to make intuitive leaps. Mozarts music does this by organising the firing pattern of neurones in the cerebral cortex. The music of Gregorian Chant can help students to learn more effectively. The most in-depth use of music to accelerate learning was developed by the Bulgarian psychologist, Geogi Lozanov. Developed initially for adults studying foreign languages, his technique known as Suggestopedia has been incorporated into curricula throughout Europe and the United States. He has proved that slow baroque music improves learning. Dons book has three hundred pages crammed with evidence of musics healing powers. Campbell lists fifty common illnesses that have all responded to sound and music. Campbell provides conclusive evidence that music; particularly Mozarts music can be used to reduce high blood pressure and anxiety. Music can break up cancer cells in our bodies and can help to heal mental illnesses. Scientists concluded that preferred music may produce a positive emotional experience that can release hormones, which create a healing effect in the body. The director of Baltimore hospitals coronary care unit says that half an hour of classical music produces the same effect as ten milligrams of valium. Don includes many inspiring stories of people who have been given a new lease of life through music therapy who had previously been written off by society. The parents of autistic children have found that music therapy can help their children to interact with them in a normal way. Sam a seven-year-old child diagnosed with autism at the age of two would be unable to tolerate any loud sound. He had tantrums and when his mother sang to him he would say to her, "stop singing." After sound therapy he said to his mother "Hold me" Hum with me." The Journal of the American Medical Association reported in that in a study of expectant mothers, those who listened to music during childbirth did not require anaesthetic. Listening to music releases endorphins and this decreases the need for medication. It also provides a distraction from pain and relieves anxiety. In another study of pregnant mothers, babies were found to prefer Mozart and Vivaldi to other composers in early, as well as the later stages, of pregnancy. When mothers listened to rock music, foetuses would kick violently and have increased heart rates. Researches at the John Hopkins University have found that rock music causes people to eat faster and to eat a larger volume of food, while slow classical music makes people eat more slowly and consume less. The book also contains practical exercises to help the reader incorporate sound and music into their daily ritual. The book also contains an excellent bibliography and section on sound resources.